Clean the chicories: remove the leaves and base, run them under water and dry them. Cut them into julienne strips and add lemon so they do not brown, then set aside. Peel the onion and garlic cloves, cut into half slices and fry them in butter. 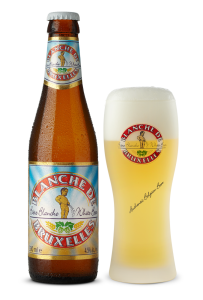 Half-way through cooking, add the chicory and cook for 10 minutes, then add the Blanche de Bruxelles, reduce by half, add the sugar and a bit of veal stock to thicken slightly, then add salt and pepper. Keep warm. Clean the Brussels sprouts and cook them in boiling salted water. Half-way through cooking, run them under cold water, then cut them in half and set aside. Brown the chicken on each side in a large saucepan. Place them on a gastro tray and finish cooking in the oven at 150 degrees. Peel the potatoes and cut them into quarters, cook them in boiling salted water until al dente. Fry the smoked lardons in a pan without adding any fat. Add the Brussels sprouts, thyme, salt and pepper and let it heat. Gently warm up the sauce. Plating Plate the fillet of chicken, pour over the chicory sauce, and plate the Brussels sprouts with lardons and potatoes. Garnish with chopped parsley.